Discussion in 'WordPress' started by Adhen, Oct 6, 2015. I bought the plugin because I looked for a way, to sync the xenforo with wordpress and after two hours of reading your documentation and some try and error, it works now - I think so. But I have some questions: Is it possible to create Xenforo Threads for Wordpress Pages? It works with posts but not with pages? It does not save the forum for a post when I save a draft. But some posts are scheduled. There are no threads for this posts and I have to update every scheduled post after it was published to create a thread. Is it possible to to sync a XF Thread that already exists to a WP post? Hm, to test the plugin I have pushed a forum to a post. Saved. Okay it worked. But what happend if I do this again with another forum? Okay, now two threads are synced to the post... but how can I remove the second thread from the post? Hope you can understand me, english is not my native language. This point is very important, could anyone develop a solution for this? @Adhen It's confirmed that sync for scheduled post is currently broken. Fix should be available soon. Sorry for the inconvenience. It's confirmed that sync for scheduled post is currently broken. Fix should be available soon. Sorry for the inconvenience. @xfrocks Soon is when? Are you still working on this? The sync for scheduled posts is still broken. And there are some syntax errors in your Login sync JS. Looks like your minify plugin picks up some PHP file and some JSON file. Probably you need to track down exactly what files are those and exclude those files from being minified. Regarding the sync issue, sorry the fix is not out yet. Is it possible to sort the boards in the dropdowns in the wordpress posts by the order in the forum. Now you sort them by the ID but if I have two boards that have the same Name (for example: Board1 - Subforum 1(News), Board 2 - Subforum 2 (News)) sometimes I don't know, wich board to choose. Regarding the first issue, yeah, the sync logged-in cookie feature loads another file so you need to exclude it from being minify to work properly. For the 2nd issue, that error occurs with that feature turned on and the error is logged in browser console? That doesn't sound good, can you send me your url so I can come and check? For the question: nice suggestion. This should be available in the next release. Final Fantasy, Kingdom Hearts und ein paar andere Square Enix Perlen: Hier gibt es Guides, Informationen und Neuigkeiten dazu! And did you checked it already? Latest version has been tested to work with scheduled post fyi. 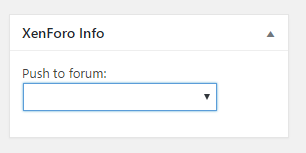 Hi, when I save a schedulded posting, the forum dropdown is empty. Is thar correct or must the forum be selected? But most important is the thing with the single sign-on. The cookie is not working. The errors from above still appears. Which drop down? Can you provide a screenshot? For scheduled post, the plugin won't make any changes until the post is published at the scheduled time. After that happens, the plugin will sync the post etc. as per configured. Please disable the minify plugin and see if it works? @Adhen If nothing show up in that select box, you need to check the plugin settings page. You may need to reload it too (there is a link for that). Also, I don't seem to get that error going to https://finalfantasydojo.de/, is that still your site address? @xfrocks I have deactivated the Option for the sync cookie. now it is activated and the error still appears. Your website tries to load "https://finalfantasydojo.de/forum/api/index.php", which it shouldn't do at all. Do you still have the minify plugin turned on? @xfrocks No I don't know. When I disable the Sync logged-in cookie option, the line disappears. No I don't know. When I disable the Sync logged-in cookie option, the line disappears. https://finalfantasydojo.de/forum/api/index.php?assets/sdk&prefix=xfac (notice the query string, it has been stripped off from your site). Do you have any other plugin that may change / optimize js etc.? Is this some plugin of yours? It would not recommend missing our with version query in script urls. Sometime they are needed for proper cache busting. This is some security stuff, to prevent that other people can se the used wordpress version. Wenn I tried to ignore the api php file but it doesn't work. Do you know how I can skip the file from your plugin?